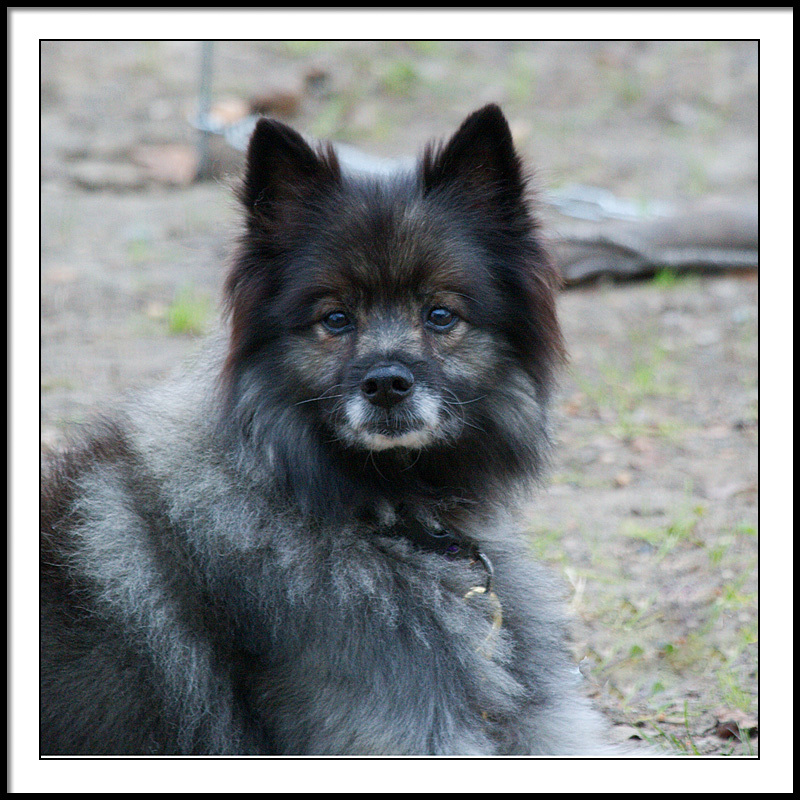 Kit was our Keeshond that had been battling congestive heart failure for several months. Even so, when her energy permitted, she was still the mischievous little puppy that we brought into our home nearly 12 years ago. Kit was always the first one on the scene when there was trouble to be had, and not far behind, she would be dragging our male Keeshond, Bear, into the action too. Kit had that something special, and as my wife can tell you, she loved to get into things simply to get my attention, and then the game would start. My wife loves to tell the story from many years ago, when after a long day of working on the yard, I made a trip to McDonalds and picked up a couple of burgers. I brought them home and set them on the small round table that we had in the kitchen at the time, and turned back to the kitchen to get something to drink. Kit, as always, was on the prowl for trouble, and my dinner proved irresistible. I was about half way to the kitchen when I realized what was about to happen, and I turned and ran back ... but it was too late. Kit had nabbed one of my burgers and was enjoying it with a devilish little tail wag. That was it, I took off full speed after her to liberate my burger, but she had other plans. Kit started running circles around the table while continuing to eat my burger, with me always one step behind. I could not believe it! And, then in a moment that would define Kit's mischievousness, she made a quick swipe of the table and got my other burger at ate it too, while I continued chasing her around the table. You know, I never did catch her, and you could tell by the little extra bounce in her step as she went out the door, that Kit was very happy with herself. My wife's laughing proved to be contagious, and once I resigned myself to the loss, I could not help but to laugh myself. That was the essence of Kit. The other story that I will share about Kit has to do with our efforts to "train" her. You see, we never did train her, in fact it is clear now that she trained us. When she was younger she had a terrible habit of putting her paws on the counter top so she could look for "snacks". and then she would half leap up on the counter top and take what ever she wanted. It did not matter where it was, if she wanted it, she got it. So we talked to a trainer that told us that this was easy to remedy, and she instructed us to place mouse traps on the counter tops overhanging the edge by an inch or so. When Kit jumped up, the traps would snap and scare her off. It sounded like such a great plan that I went straight to Home Depot and picked up 20 shiny new mouse traps, and once again the game was on. It turns out that 20 mouse traps on your counter tops are quite a nuisance, not for Kit, but for us! Even so, we put up with the mouse traps in our attempt to "train" her. After a few weeks, the food was still disappearing even though the traps were knocked down and set off. We were baffled. Then, one day my wife and I came upon Kit in the kitchen, and she was so busy that she failed to realize that we were watching her. Kit proceeded to hop up on each counter with just one paw, leaving the other one free to systematically bat the mouse trpas back setting them off in the process. When she finished dismantling my booby trap, she casually jumped up and helped herself to what ever she wanted. Once again, all we could do was laugh. Sadly however the last few months proved that all of her energy and playfulness was no match for the disease that ravaged her heart. She had all the will in the world to be the puppy she always was, but as each day passed, her ability to get up and around simply abandoned her. Then, at 4:30 PM today with my wife and I by her side, she took her final gasp and closed her eyes. She was once again at peace. She will be missed by our family tremendously. The kids are happy with the thought of her chasing rabbits and squirrels in "doggie heaven". I guess my wife and I are too. What a beautiful little girl. I am very sorry for your loss. We too have lost a number of furry friends, their friendship and the joy they bring to our lives are priceless. A truly loved dog...beautiful portrait of your sweet girl. A dog such as Kit can never be lost. She was loved and nurtured while she was with you, and loved and remebered now. Dogs are not just our friends, they are our partners and companions. She was looking out for you- took away your high cholesterol burger, and made sure you got exercise instead, running around the table! An unforgetable personality. Nice story. Sorry for your loss. I am so sorry. Pets are our family. You have my sympathy. Sorry for your loss. Beautiful girl and a beautiful life. Sorry to hear about your loss.